The sun is shining, the birds are chirping, and Peter Cottontail is hopping along his sandy trail right next to Destin Palms Vacations getting ready for Easter Weekend Events in Destin 2019, big & beautiful Easter Extravaganzas! The Destin area always turns out a ton of activities centered around holidays for visiting families and Easter is certainly no exception. Make sure to stay up to date and in the know with all of Destin’s current events on our Events Page, in addition to the list of the amazing festivities the city has going on for the Holiday weekend below. Easter Crafts at the Destin Library. Friday from 1-4 PM, bring your children ages 4-12 and so they can get crafty and make an Easter magnet. Free and open to the public. Destin Library. Destin Annual Easter Egg Hunt. The annual Easter Egg hunt for the whole town will be held at the Morgan Sports Center, 4200 Indian Bayou Trail, beginning at 9:00 AM. For ages 12 and under. 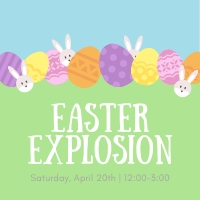 Bounce on over to the Village of Baytowne Wharf for an Easter Explosion this holiday weekend, Saturday, April 20th! Enjoy a day filled with family-friendly entertainment, enjoy lawn games, face-painting, and even race over the infamous inflatable obstacle course. And don’t forget to get your picture taken with the Easter Bunny! Experience a memorable Easter Egg hunt with The Henderson Beach Resort! They will have a helicopter drop thousands of candy-filled Easter eggs on their Front Lawn! Join them before or after the hunt for Easter Brunch! Don’t Forget to Bring your Easter baskets and make memories with The Henderson! Ever wonder how all those eggs get to be hidden for the hunt? Well, come see the helicopter Easter Egg drop candy-filled eggs on the front lawn of the Henderson. The drop will be at 12:30 PM so be sure to get there early to get a good spot to watch! Head over to Lulu’s at the base of the mid-bay bridge to enjoy the mad Dash for the golden eggs for LuLu’s Easter Egg Dash. The Easter Bunny will be making a special appearance for photo-‘hops’. Festivities start at 2 PM, but we recommend going early to get the best spot! The dash is divided into age categories, making this event is fun for the whole family!